Internet of Everything: Is your company ready for machine intelligence? We are on the verge of a new era of smart connected things, where devices and machines are much more intuitive, simplifying and enriching our daily lives. As smart devices pack more powerful processors and sensors, they will become more aware of our preferences and surroundings, anticipate our needs, and provide us with relevant information at the right time. As machines of the future begin to see and hear in 3D through computer vision and perceive and understand through machine learning, new worlds of possibilities open. Cars, machines, robots, and other smart devices will become autonomous, anticipating outcomes far faster and more accurately. In this webinar, we’ll dig into how industry leaders are using cognitive technologies, such as machine learning, computer vision, and always-on sensing to reshape industries, including transportation, healthcare, banking and retail. Can your business keep up with the disruption that will be caused by these technologies? How can device intelligence add value to your organization? How can you balance the benefits of device intelligence with associated risks? 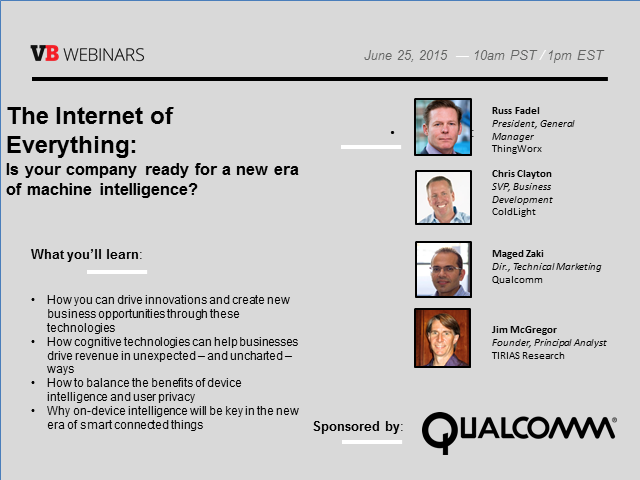 Title: Internet of Everything: Is your company ready for machine intelligence?